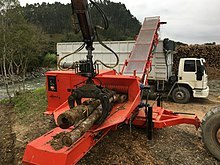 This type of machine is used to chip large pieces of wood. A portable woodchipper and truck with wood chips collected in the truck bed. Wood chips from a small garden chipper. A tree chipper or woodchipper is a machine used for reducing wood (generally tree limbs or trunks) into smaller woodchips. They are often portable, being mounted on wheels on frames suitable for towing behind a truck or van. Power is generally provided by an internal combustion engine from 3 horsepower (2.2 kW) to 1,000 horsepower (750 kW). There are also high power chipper models mounted on trucks and powered by a separate engine. These models usually also have a hydraulic crane. 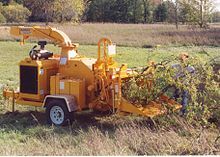 Tree chippers are typically made of a hopper with a collar, the chipper mechanism itself, and an optional collection bin for the chips. A tree limb is inserted into the hopper (the collar serving as a partial safety mechanism to keep human body parts away from the chipping blades) and started into the chipping mechanism. The chips exit through a chute and can be directed into a truck-mounted container or onto the ground. Typical output is chips on the order of 1 inch (2.5 cm) to 2 inches (5.1 cm) across in size. The resulting wood chips have various uses such as being spread as a ground cover or being fed into a digester during papermaking. Most woodchippers rely on energy stored in a heavy flywheel to do their work (although some use drums). The chipping blades are mounted on the face of the flywheel, and the flywheel is accelerated by an electric motor or internal combustion engine. Large woodchippers are frequently equipped with grooved rollers in the throat of their feed funnels. Once a branch has been gripped by the rollers, the rollers transport the branch to the chipping blades at a steady rate. These rollers are a safety feature and are generally reversible for situations where a branch gets caught on clothing. The woodchipper was invented by Peter Jensen (Maasbüll, Germany) in 1884, the "Marke Angeln" woodchipper soon became the core business of his company, which already produced and repaired communal- and woodworking-machinery. Shredders that make use of high-torque low-speed grinding rollers are growing in popularity for residential use. These shredders are driven with an electric motor and are very quiet, dust free, and self-feeding. Some of these machines are equipped with an anti-jamming feature. The original chipper design employs a steel disk with knives mounted upon it as the chipping mechanism. This technology dates back to an invention by German Heinrich Wigger, for which he obtained a patent in 1922. In this design, (usually) reversible hydraulically powered wheels draw the material from the hopper towards the disk, which is mounted perpendicularly to the incoming material. As the disk spins, the knives cut the material into chips. These are thrown out the chute by flanges on the drum. This design is not as energy-efficient as the drum-style design, but produces chips of more uniform shape and size. Most chippers currently used by commercial tree care companies are disk-type. Consumer-grade disk-style chippers usually have a material diameter capacity of 6 to 18 inches (15 to 46 cm). Industrial-grade chippers are available with discs as large as 160 inches (4.1 m) in diameter, requiring 4,000 to 5,000 horsepower (3,000 to 3,700 kW). One application of industrial disk chippers is to produce the wood chips used in the manufacture of particle board. 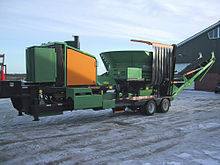 A modern drum chipper "Bandit Industries Model 1290H"
Newer chippers employ mechanisms consisting of a large steel drum powered by a motor, usually by means of a belt. The drum is mounted parallel to the hopper and spins towards the output chute. The drum also serves as the feed mechanism, drawing the material through as it chips it. 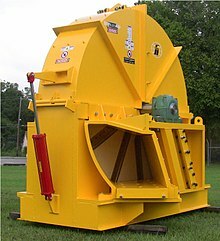 It is colloquially known as a "chuck-and-duck" chipper, due to the immediate speed attained by material dropped into the drum. Chippers of this type have many drawbacks and safety issues. If an operator becomes snagged on material being fed into the machine, injury or death is very likely. Chippers of this type are also very loud. The chips produced may be very large, and if thin material is inserted, it may be cut into slivers rather than chips, and since the drum is directly driven by the engine, materials that are too large or long may stall the engine while usually remaining firmly stuck in the drum. Much larger machines for wood processing exist. 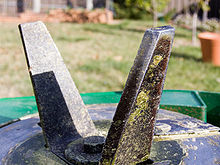 "Whole tree chippers" and "Recyclers", which can typically handle material diameters of 2 feet (61 cm) to 6 feet (180 cm) may employ drums, disks, or a combination of both. The largest machines used in wood processing, often called "Tub Grinders", may handle a material diameter of 8 feet (240 cm) or greater, and use carbide tipped flail hammers to pulverize wood rather than cut it. These machines usually have 200 horsepower (150 kW) to 1,000 horsepower (750 kW). Some are so heavy that they require a semi-trailer truck to be transported. Smaller models can be towed by a medium duty truck. The cutting blades of a small electric chipper. The blades can be removed, by loosening the bolt in the center, to facilitate sharpening or for replacement. Although chippers vary greatly in size, type, and capacity, the blades processing the wood are similar in construction. They are rectangular in shape and are usually 4 inches (10 cm) to 1.5 inches (3.8 cm) across by 6 inches (15 cm) to 12 inches (30 cm) long. They vary in thickness from about 1.5 inches (3.8 cm) to 2 inches (5.1 cm). Chipper blades are made from high grade steel and usually contain a minimum of 8% chromium for hardness. Thirty-one people were killed in woodchipper accidents between 1992 and 2002 in the US, according to a 2005 report by the Journal of the American Medical Association. ^ Haldane, David (November 9, 2007). "Man killed in wood-chipper accident is identified". Los Angeles Times. Retrieved 2008-07-22. Wikimedia Commons has media related to Shredder.